In college, fluid mechanics only got less than an hour of discussion during my junior year. And, yet, I've spent perhaps a quarter of my career performing hydraulic calculations. Either the professors didn't realize the importance of fluid mechanics or dismissed it as too easy to bother with. 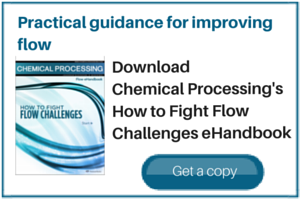 So, what do you need for a fluid flow problem? Modeling software certainly can play a key role, although chances are you can't model the whole plant. However, any program is useless without three things: a good layout of the pipe network; accurate equipment specifications; and reliable in-depth trend data for the boundary conditions (including starting and ending pressures). Don't trust any layout until you've conducted a walk-down. You must identify pressures and flows into the network; process and instrumentation diagrams (P&IDs) may or may not help. Interview a few operators and engineers to validate the specifications. (I've seen tank data so old the data sheet pre-dates Teddy Roosevelt!) You may need heights that were omitted from the isometric, so use a clinometer for ±6-in. accuracy (see: "Strive for a Surveyor's Eye.") Don't get bogged down correcting drawings — stick to the mission. Once you've got the layout and the equipment sorted out, it's crucial to understand the limits of your modeling software. Some packages won't calculate area changes properly. I discovered that one program calculated expanders accurately but was wrong for reducers. Others can't estimate losses from mixing or splitting streams. Most will allow a pressure drop versus flow equation for equipment drops; avoid input errors by automating equipment losses. Many models won't estimate temperature despite its important impact on viscosity and density. I use process simulation software to determine temperature changes and then add these values to the hydraulics package for the pressure losses. Now, it's time to consider fitting losses, which usually are calledKfactors following the terminology of "Crane Technical Paper 410" — I prefer to use the summarized version in "Cameron Hydraulic Data." This approach stems from the Darcy-Weisbach equation relating head loss to length of flow, pipe diameter and roughness of the pipe surface. The equation strictly applies to turbulent flow; realistically, strange things begin to happen below a Reynolds number of 10,000. Here're some guidelines on the use of K factors and on fluid analysis in general: 1) use the most conservative K factor available — Crane 410 tends to under-estimate pressure drop for fittings; 2) for entering and exiting equipment and vessels, like heat exchangers, add K = 0.5 for the entrance and K = 1.0 for the exit; 3) most pumps, and perhaps blowers and compressors, allow for entrance and exit effects, so don't add them; 4) remember to consider reducers and expanders on equipment — they can significantly contribute to losses (the online version of this article contains a table with K factors for Schedule 40 and 80 pipe); rules of thumb such as using 30° for the assumed angle don't work well — it's best to measure an angle from a drawing; 5) K accounts for changes in shape, not length; add the fitting length to the pipe length; head loss is the sum of length losses and fitting loss; 6) some models don't provide values for fittings, so substitute a value from Crane; 7) use the same K factors for liquids and gases — up to 15% change in pressure; 8) don't apply the wrong radius/diameter (r/d) for welded and flanged 90° elbows, r/d = 1.5; 9) use standard elbows for threaded or socket-welded 90° elbows; 10) use sudden expansion or contraction for eccentric area change or for common plate reducers where a small pipe is snubbed into a large blind flange; and 11) apply a generous fouling factor when field measurements are unavailable — I recommend a 20% multiplication factor for heat exchangers. Watch out for where Darcy-Weisbach doesn't apply. If a fluid passes a threshold where its velocity is 30% of sonic velocity, use isothermal or adiabatic flow instead. Adiabatic is about 10% more conservative, from my experience; for pneumatic conveying I've successfully used adiabatic flow. Also don't rely on Darcy-Weisbach for non-Newtonian fluids, e.g., pastes, gels, strong suspensions, polymers, two-phase fluids or fluids undergoing phase transition. Sometimes, the equivalent length method might work effectively but I tend to doubt it. With unusual fluids, it's best to conduct experiments as were done to create the original K factors. Most companies that build pumps for non-Newtonian service will provide fitting equivalent length measurements if you buy a pump. Some may be willing to determine the measurements for a small fee. Some equations have stood the test of time. Less accurate and expensive sensors may suffice for non-critical applications.